Biker & Rebel Stock Lapel Pins - Custom or Stock, Keyholders, Emblematic Jewelry - FACTORY DIRECT TO YOU 3-Day or 5-Day Rush Service Available | Free 10-Day Rush | NO DIE CHARGES Discounts for Government, Organizations, Teams & Corporations Best Prices in the America's for Lapel Pins, Cloisonné Keyholders, Corporate Jewelry & Emblematic Gifts We also manufacture fine crystal or marble paperweights, awards & gifts - call or email for quotations Rush Service Available. 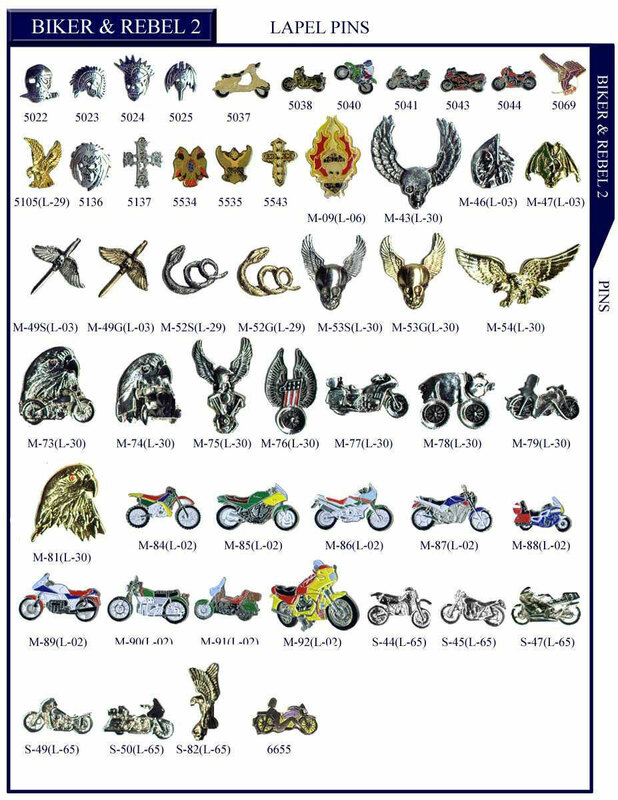 Quality motorcycle stock lapel pins. Thousands of motorcycle, biker and rebel stock lapel pins in stock ready to ship. Major categories to choose from. Biker, Motorcycle and Rebel lapel pins in stock.